By now, we’ve all seen the Ad … three perfectly cute multi-ethnic girls and their contraption (known as a “Rube Goldberg” machine – is that a generic term? – sorry, I digress) that is as long as a song … a 2:06 song (or commercial) which parodies the Beastie Boy’s “Girls,” which itself could be categorized as satire. Aren’t those girls adorable? What an empowering message! And that tune is so damn catchy. The Beastie Boys never had a chance. And that’s exactly how GoldieBlox wanted it. I initially had the same reaction as most people … why would the Beastie Boys allow this to turn into a public legal spat? Seemed like a “missed opportunity” as Mike Masnick wrote over at TechDirt. But in that very same article, Mr. Masnick labels the Beastie Boys “bullies” and others in the media (social and traditional) shared that sentiment … campaigns were started on Twitter and elsewhere calling on the Beastie Boys to just “let this go. FOR SCIENCE”(copyright law be damned) … some inaccurately reported that the Beastie Boys sued GoldieBlox (here’s my initial tweet and ensuing exchange with Mr. Masnick over Twitter prior to posting this article). It was the girls who started this fight. And I found that curious. The GoldieBlox video that started this whole dispute was uploaded to YouTube on November 17, 2013 – an Ad that includes the words BEASTIE BOYS in the title (necessary? trademark infringement?). A mere four days later, on November 21, 2013, GoldieBlox filed a declaratory judgment action in California. It’s almost as if the complaint was drafted and ready to go the moment that video was shared on YouTube. All indications are that GoldieBlox never bothered to clear the rights to use the song. And four days is very little time for the parties involved to try to work this out without having to resort to the judicial system. “Missed opportunity” … were the Beastie Boys even given an opportunity? Or is GoldieBlox being opportunistic? But I ask … is this fair use? Or, to be more specific … “clear cut fair use,” the kind upon which sound legal advice typically rests? My answer to the fair use question is … it’s not clear and anyway there is no fair use unless a judge says so. But this is NOT “clear cut fair use.” These set of facts and circumstances are not analogous to a Weird Al or 2 Live Crew parody. GoldieBlox is using the song to sell toys. What if MATTEL had done the exact same Ad instead of a startup company whose noble goal is to “inspire the future generation of female engineers”? Or GENERAL MOTORS to market a line of pink cars targeted to girls (of legal driving age). The legal analysis is supposed to be the same … but I suspect the public outrage would not have been. Lets leave those adorable little girls out of this. This appears to be a calculated viral marketing campaign designed to tug at viewer’s heartstrings and dare the Beastie Boys to do something about it … and should the Beasties react … GOOD! … that’s the whole point. The sound of Streisand must have been playing in the background when they hatched this plan. How dare those Beastie Boys try to stop an Ad for a product that empowers little girls … over a copyright claim to a misogynistic song. But this video had already gone viral before the suit was initiated … a suit that was initiated not by the rights holder but by the unauthorized user. So what do you call that … the Reverse Streisand Effect? A little digging online reveals that the team behind GoldieBlox is not new to viral marketing campaigns and that the Ad is in competition to be shown during the Super Bowl. 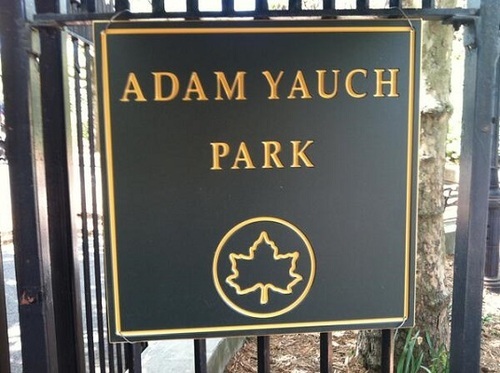 There’s also the side note that Adam Yauch, a founding and deceased member of the Beastie Boys, left a will in which he stated that the band’s music was not to be used for advertising. But that’s just a dead man’s wishes and not a part of the fair use analysis. It’s the week of Black Friday and Christmas is just a month away. I’d like to buy my daughter a toy, preferably something she can use with her big brother … and not fight over. ← Trademarkia … How Do You Justify That?